This is part two of the Moosie Awards for Excellence in the Fields of Excellence, Nature and Algonquin Park Related Stuff. For Part One, click here. 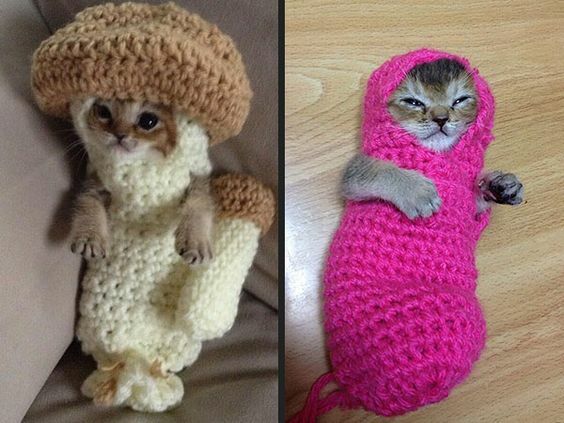 For a picture of a kitten dressed up in a mushroom costume, click here. Narrowing down my Favourite Lake is like being asked to choose between Jason Statham and Vin Diesel for my favourite short, bald, hard to understand action movie star. It’s damn near impossible and not fair of you to ask. However, it can never be said that the Moosie committee shies away from the tough choices, and just like our recent decision to give Vin Diesel 51% of the wall area in our floor to ceiling Jason Statham and Vin Diesel collage, there is one lake that slightly edges out the others for this year’s Moosie. First, let’s run through some honourable mentions: Sunbeam Lake, Cork Lake and Drummer Lake all made pretty strong cases to take home this award. I’ve waxed poetic about each of these in other posts, but briefly: Sunbeam is a medium sized lake north of Tom Thomson with clear water, a feeling of seclusion despite being close to the Park’s main corridor and some great sites. Cork Lake offers diverse scenery, great swimming and (spoiler alert) gets more recognition in one of the next categories. Drummer Lake is west of Canoe Lake and requires an almost 2 km portage to get there (among others). 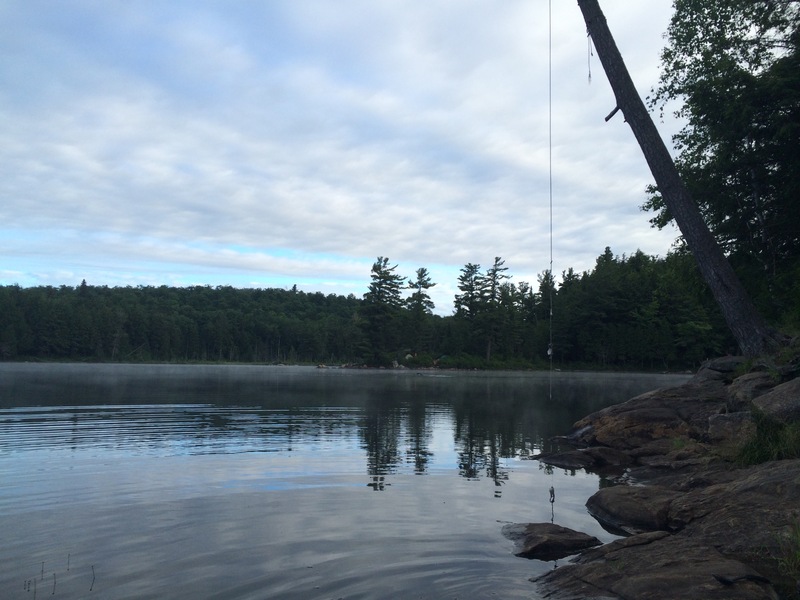 As a reward for all that hiking, there’s privacy, great scenery and a lean-to with a rope swing at the end of the portage where you can stop for lunch and practice your Algonquin Ninja Warrior skills. However, my favourite lake of the summer has to be Lake Louisa. It’s a function of when I reached Louisa (about an hour before sunset), but the entire lake seemed to be bathed in the kind of warm fuzzy glow you usually get in movie (or clip show!) flashback scenes when the hero is thinking back to happier times with his (insert one: family/hamster/pizza), before the bad guys arrive and wreck up the place (or eat his pizza). Watching the sun set over the western half of Louisa from one of the island sites while you eat your dinner after a hard day of tripping is an experience I recommend to everyone. So, once you get to one of these lakes, where should you stay? Great question, glad you asked it. And, what a strange coincidence, here comes the Favourite Campsite category. I stayed on a number of sites this summer, and stopped over for an hour or two on many more. (I also swatted like six million mosquitoes, but that’s totally unrelated to what we’re talking about here. Just an FYI). For the most part, the sites were all in pretty good condition and would make for decent places to spend a night or two. Some of my favourites include the windy point site on Opeongo, the narrows site on Harness Lake, the island site across from the Vanishing Pond portage on Sunbeam and Bearshark Island on Pen Lake. But, far and away, the best site I visited was on Cork Lake. 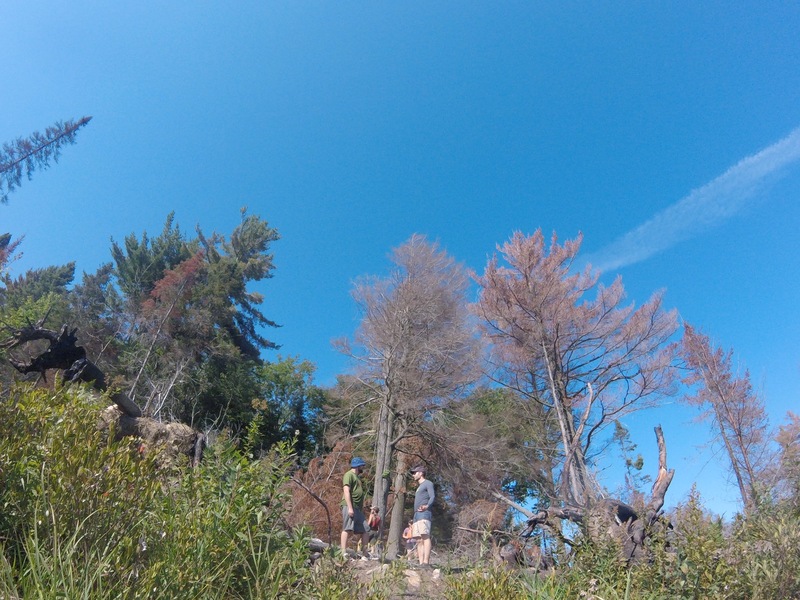 I went into it in detail in my Barron Canyon post, but to recap: the site we stayed on is the easternmost site on Cork. The site is well maintained, has multiple tent spots (including a fantastic spot on a ledge overlooking the lake), useful campsite additions (two tables), great jumping and swimming ledges, privacy and great western view for sunsets (and sunrises if the earth ever reverses it’s spin). I highly recommend spending a night on Cork. A table, a fire pit, some benches. What more do you need? Great fire pit with a view. Lots of wood because the loose soil means a tree falls every five minutes and we definitely heard it. Oh look, it’s the Least Favourite Campsite award. Hi, Furrow Lake. Thanks for showing up. You had the only sites in this category. Your primary option is a burned out, post-apocalyptic hellscape. Your secondary option is a tiny island in the middle of a garbage creek with no level ground, access to potable water or spots to pitch a tent. Picking between the two is like choosing between brushing your cat’s teeth or giving your dog a suppository. Either way your day probably isn’t ending well. So it’s a tie. 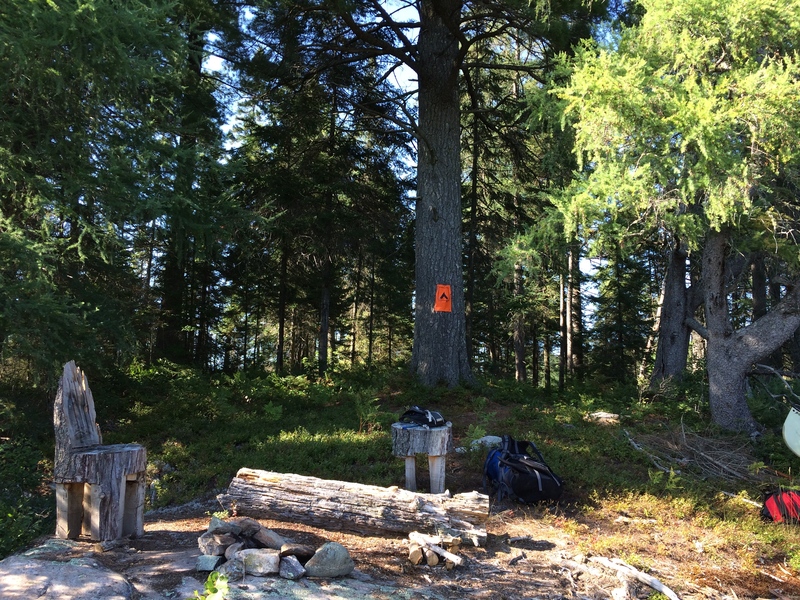 The campsites of Furrow Lake take the Moosie unopposed. Congrats, Furrow. Maybe see if you can sell your Moosie on EBay and use the cash to spruce things up a bit. Thanks. Sign, sign everywhere a sign. And now we’re down to the final award of the day. Picking my Favourite Route is no easier than choosing my favourite lake. No matter where you go in Algonquin there’s going to be something incredible to see or do and the things that make a route great for one person might make it awful for someone else. That being said, I’m someone who really likes the tripping part of a canoe trip more than the camping part. I like paddling and I like portaging and I like seeing what’s around the next corner. I get kind of bored once I’m on site. So, my favourite routes are probably also the ones that I found the most challenging and kept me on the water the longest. Keep that in mind if you’re using this as a reference for your own route planning (and for God’s sake look at other sources. I forgot my map, permits and headlamp on one trip. I’m probably the last person who should be giving out recommendations). There are parts of every trip that I really enjoyed. My tour through the Ahmek District was physically challenging (and at times felt physically incapacitating) but that trip would definitely be a top recommendation for anyone looking to see a more rugged part of the Park. The lakes on this route are beautiful and private and even though most of the portages could use a good chainsawing, I really enjoyed the challenge and the feeling of seclusion as we plunged deeper into the brush. For someone looking to stay a bit closer to the beaten path, but still get a good Algonquin experience, either the Sunbeam Circuit or a loop down to Louisa from Ragged would fit the bill as well. The trails along both these routes are mostly very well maintained, and you get a good mix of paddling and portaging on each. However, if I was only going to be able to redo one trip from the summer, it would be the Barron Canyon trip I took in mid August. This was an overnight that offered a bit of everything. Stunning scenery, some historic elements, it’s physically demanding and includes the best campsite I stayed on this summer. The only suggestion I’d have would be to think long and hard about whether you want to do the Cork Lake to Length Lake portage if you end up staying overnight on Cork Lake (and then, if you decide you do, think again). An alternate exit route would be to double back through Opalescent and then through Ooze Lake. Or get picked up by a helicopter. Whichever works. Leap before you look. Wait, no. That doesn’t sound righ-. Remains of a pointer boat. No sign of its pointer captain. And that’s it for this year’s Moosie Awards for Excellence in the Fields of Excellence, Nature and Algonquin Park Related Stuff. Congratulations to our winners. To our losers: try harder next time. I’m hoping to make at least one trip to the Park this winter, so stay tuned for that. I’ll also have a couple of posts on Algonquin related items, including, someday, my long promised epic post on my trip to the Algonquin Logging Museum this past summer. I’ve also been giving some thought as to where I want to go from here (answer: everywhere). Frankly, 100 lakes just isn’t enough. But more on that another time. So, until then, enjoy the heck out of your fall/winter and see you on the water.